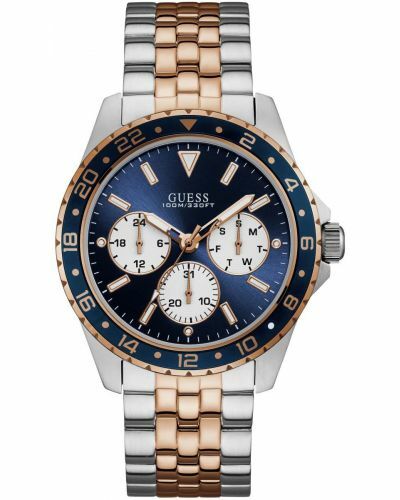 Sophisticated yet sporty the men’s Odyssey watch by Guess is the perfect timepiece for today’s modern man. Featuring a polished stainless steel 44mm round case with a red and blue coated bezel which has been marked allowing for 24 hour reading; the Odyssey watch is a multi-functional masterpiece. With an alluring deep blue sun-ray dial and three contrasting white sub-dials, the Odyssey allows for the day, date and a 24-hour clock to be simultaneously displayed. Bold white luminous hour markers are complimented by the skeletonised white batons which also luminesce in low light conditions. 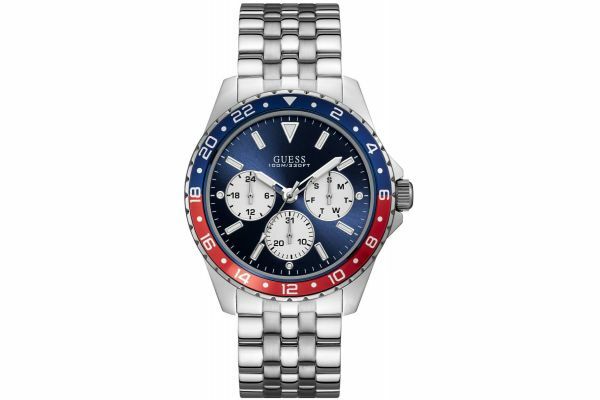 Set upon a suave 5 link highly polished stainless steel bracelet and secured by a fold over with push deployment closure; this watch is ideal for both formal and casual attire. Powered by Quartz movement and protected by mineral glass and a screw crown; the Odyssey watch is water resistant up to 100 meters and comes complete with a two year guarantee. For us to size your new Guess Odyssey watch as accurately as possible, please take a look at our downloadable Watch Sizing Guide.